Rail budget lacks focus: Congress vice-president Rahul Gandhi. Rail budget was being presented and TMC members were raising slogans against PM: Jagdambika Pal. Two BJP MPs abused and threatened to attack us. I am sure they were drunk: TMC MP Satabdi Roy. BJP MPs threatened us and badly abused our women MPs: TMC MP Kalyan Banerjee. We were peacefully protesting inside Lok Sabha. One drunk BJP MP along with others came and threatened and abused us: Kakoli Ghosh Dastidar, TMC MP. We believe in working, not just receiving applause. We will fulfill all promises: Shrikant Sharma, BJP. We must protest peacefully, removing name plate of railway minister and stopping his car is wrong, I instantly scolded my workers: AS Lovely, Congress. Bio-toilets will be extended to more trains, on-board housekeeping will also be extended-Sadananda Gowda. A large population and a big geographical outline has been left out in the Rail Budget: Sharad Yadav, JD-U. This is a visionary budget, a budget for the future: Oil minister Dharmendra Pradhan. Has anybody seen such insults and rejection? Bengal has been totally deprived by the new Central government: West Bengal Chief Minister Mamata Banerjee. This Rail Budget is a balanced budget and will deal with problems in a holistic way: SAD MP Harsimrat Kaur Badal. This is simply a budget of PPP, FDI and privatisation: Congress MP Adhir Ranjan Chowdhury. Ye aam aadmi ko rulaane wala budget hai: Congress leader Manish Tewari. 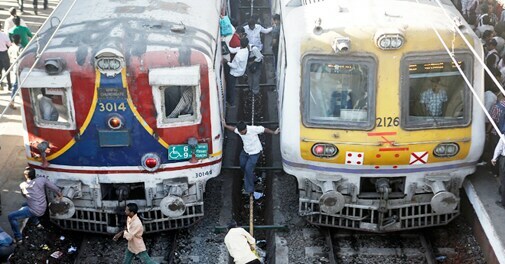 This didn't look like a Rail Budget but a privatisation of the railways: Congress leader Manish Tewari. A lot of scope for development for the North-East, a good foundation has been laid: Union minister Kiren Rijiju. Some people don't seem to be able to digest the fact that a true budget has been presented: Venkaiah Naidu. The Rail Budget is comprehensive and realistic, this government will complete ongoing projects on priority: Venkaiah Naidu. We have already done our homework as far as bullet train for Mumbai-Ahmedabad is concerned: Kirit Somaiya. This budget shows where we want to take the railways and at the same time where we want to take India through the railways: PM. Rail budget shows the important role of Railways in India's development journey: PM. This budget strengthens institutional mechanism. It focuses on transparency and integrity: PM. Railway budget keeps in mind the development of India. We can see the great use of technology also: PM. Sure that Congress will support them in all their endeavors towards development: Former railway minister Pawan Bansal. They seem to be accusing previous governments of wasting revenue. Haven't spoken about anything new but made criticism: Pawan Bansal. We are not against FDI but this should not lead to withdrawal of reservations of backward castes: Mayawati. Mayawati takes on Gowda over Bullet trains on current railway tracks. Railway Minister Sadananda Gowda ends his speech. 5 Jansadharan, 5 Premium & 6 AC, 27 Express Trains, 8 Passenger, 5 DEMU & 2 MEMU services; 11 train extensions. 58 new trains will be introduced. Bangalore to get local trains. Special festival trains to continue. Reservation system to be revamped. Special milk tanker trains to be launched. 18 surveys for new lines, 10 for doubling and extending previous lines to be started. Passengers will be able to order food through SMSes. Temperature controlled storage for fruits, vegetables. 54 per-cent funding hike for North-East. Dedicated parcel trains to be launched shortly. Mobile based wake-up call, station updates soon. All major ports to be linked via PPP model. Six high speed corridors identified. Semi-bullet train at a speed of 160-200KMPH for Chennai-Hyderabad, Delhi-Kanpur, Delhi-Agra, Nagpur-Bilaspur, Delhi-Pathankot. Paperless office of Indian railways within 5 years: Gowda. New religious tourist circuits to be developed. Mumbai-Ahmedabad first bullet train route. Will hike ticketing capabilities by 250 per cent. Eco-tourism to be taken up on priority. Women RPF constables to be deployed on trains to ensure women's safely. Catering services to be improved with private parties: Gowda. Will outsource cleaning in 50 top stations. Battery-operated cars at stations for senior citizens. Escalators and lifts in stations via PPP models. Majority of projects to be funded via PPP models. Private investment invited in rail infrastructure. Budget outlay need Rs 9, 000 crore hike: Gowda. Railways seeking Cabinet approval for FDI. Mismanagement has created fund crunch in the ministry: Gowda. Doubling, tripling tracks is priority: Gowda. Require Rs 5 lakh cr to complete projects, says Sadananda Gowda. Four projects of 30-year-old are still pending: Gowda. Populism have hit railways hard as passenger losses have increased 130 per cent over 10 years, says Gowda. Focus on sanctioning rather than implementation: Gowda. Just 6 per cent funds left for new projects: Gowda. To increase railway share of freight is a big challenge. Railways account for only 31 per cent of total freight in the country. We aim to become the world's largest freight carrier: Gowda. Challenge is to increase Railways' share of freight: Gowda. Our trains carry 23 million passengers per day, says Sadananda Gowda while presenting his maiden rail budget. Railways are the soul of Indian economy: Gowda. Gowda begins his Railway Budget speech in the Parliament. Hope we can meet public expectations: Sadananda Gowda. Railway Minister Sadananda Gowda reaches Parliament to present his first Railway Budget. Gowda will propose development of higher capacity milk van for National Dairy Development Board, parcel van and light weight wagon for carrying salt. While many unviable projects may be scrapped, Gowda will also announce some new projects on priority basis in the rail budget 2014-2015 on Tuesday. Gowda is likely to announce pilot project for introduction of automatic closing of doors in Shatabdi coaches and EMU coaches in Mumbai suburban train as safety measures for passengers to prevent accidental fall from running train. Railway Minister Sadananda Gowda reaches Parliament. The maiden Railway Budget for the Narendra Modi government is set to propose steps to boost the department's revenues, as it is saddled with a huge cash cruch of Rs.26,000 crore amid a decline in the growth in passenger earnings. Texmaco Rail & Engineering Ltd is down 1.3 per cent and BEML Ltd slumps 3.7 per cent. Titagarh Wagons Ltd, which has risen 183 per cent in 2014 compared to the Nifty's gain of 23.65 percent, falls 4.4 percent. Railway-related stocks fall on profit-taking ahead of budget. New services in suburban areas and high-speed tracks are other segments that are likely to be thrown open to foreign companies. Gowda is likely to announce allowing Foreign Direct Investment (FDI) in Indian Railways in order to help mobilise the resources needed. The passenger fares and freight charges will not be raised, but an overarching vision of improvement in infrastructure, services and outlook will form the bulwark of the Budget. Our emphasis will be on the use of technology. Railways to use social media: Sadananda Gowda. We want to make Railways people friendly, says Railway Minister Sadananda Gowda. Passenger safety and security are our top priorities, says Gowda. We will introduce bullet trains soon, says Railway Minister Sadananda Gowda. Gowda is expected to announce plans for public-private partnerships in railway infrastructure. DV Sadananda Gowda has served as the CM of Karnataka from 4 August 2011 to 12 July 2012. Gowda,61, is an MP from Karnataka's Bangalore North constituency. Railway Minister DV Sadananda Gowda will present his maiden Railway Budget in Parliament today.